Rumors are conflicting about whether the iPhone 7, iPhone 7 Plus, or both smartphones will have dual cameras, but it now appears that at least one model may not have a completely flush camera as originally expected. The dual-lens camera is accompanied by a microphone and an LED flash, as seen on previous iPhones, while the antenna bands have been repositioned along the top and bottom edges of the smartphone as we first reported last month. There are also three dots towards the bottom of the iPhone 7 Plus that appear to be for a Smart Connector, a new interface first introduced on the iPad Pro that can transmit both data and power at the same time for use with accessories. It is, however, unknown how a Smart Connector would be used on an iPhone. 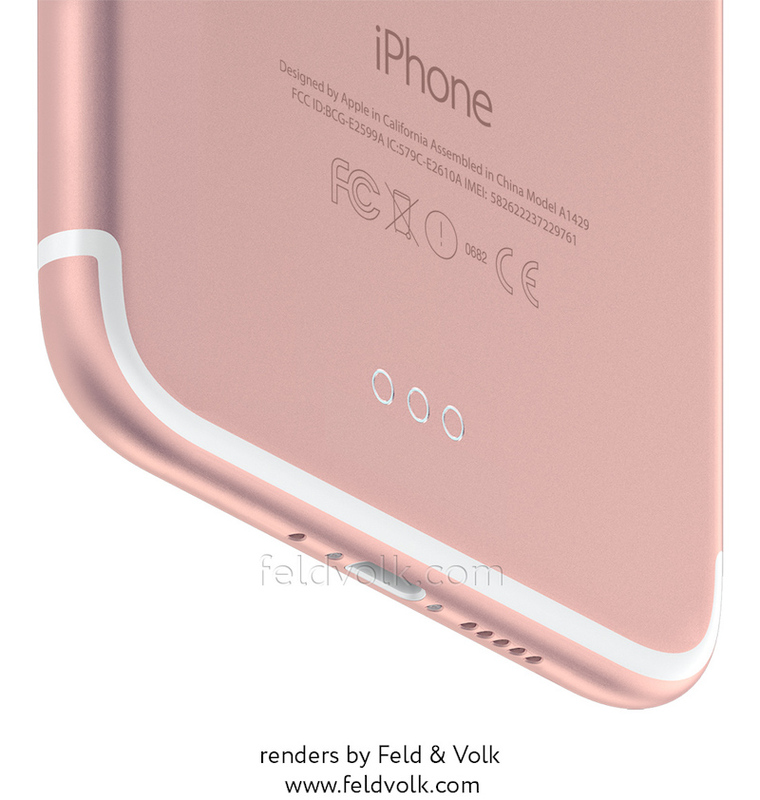 Working from past experience and the design of the phone shown in the leaked photo, aftermarket iPhone modification company Feld & Volk is already preparing its own custom versions of the device and has created several renderings that give a higher quality view of what the new iPhone would look like assuming this design is accurate. The renderings highlight the same features shown in the photo, including the dual-lens camera housed in a single oval-shaped protrusion and a Smart Connector near the bottom of the device’s rear. 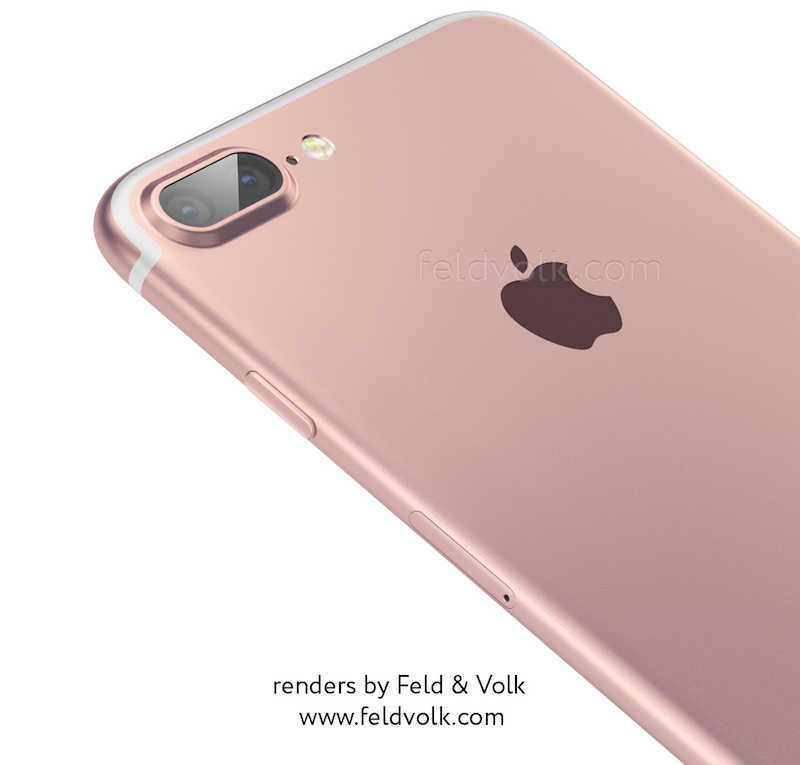 Based on its research, Feld & Volk believes that both the iPhone 7 and 7 Plus may include a dual-lens camera, contradicting several other claims that the camera will be unique to the larger iPhone 7 Plus. 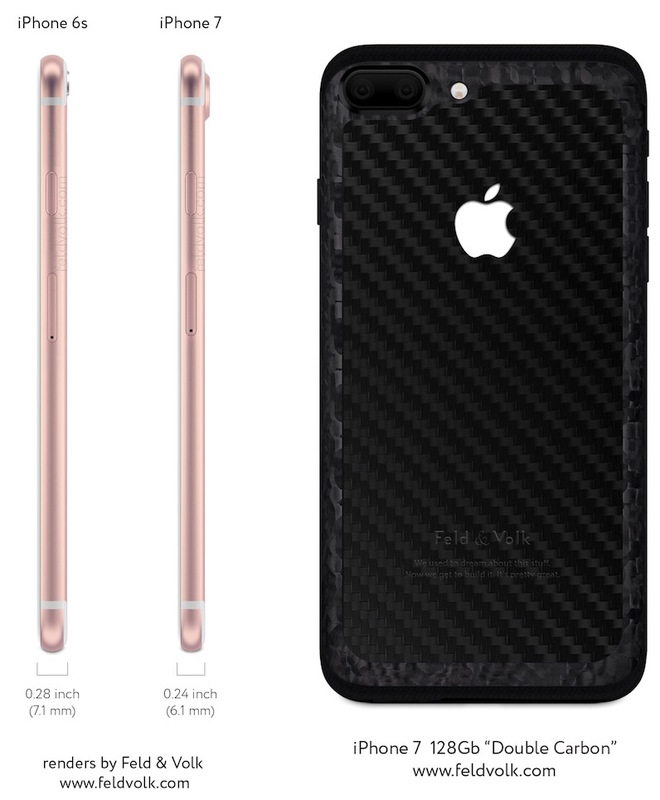 Feld & Volk also believes the iPhone 7 will measure approximately 6.1 mm thick (not including the camera protrusion), substantially thinner than the iPhone 6s and in line with the current iPod touch. 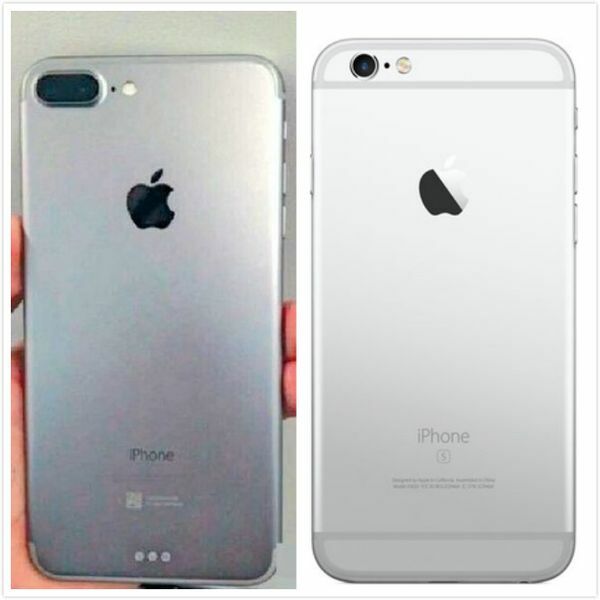 The overall look and feel of the iPhone 7 Plus chassis shown in today’s leaked photo is largely consistent with both the iPhone 6 and iPhone 6s lineups, including a unibody aluminum shell, pill-shaped volume buttons, a mute switch, and side-facing power button. The photo does not reveal the bottom of the smartphone, but multiple reports claim the iPhone 7 series will drop the 3.5mm headphone jack in favor of an all-in-one Lightning connector for audio output, charging, and accessory connectivity. The extra room on the bottom supports rumors that the iPhone 7 lineup could feature dual speakers powered by audio hardware from Cirrus Logic, although there appears to still be conflicting information on this feature. Stereo speakers route audio signals through two channels to simulate direction perception and would likely be louder.